Phil Hanson and Nigel Moore, in the Tockwith Motorsport Audi R8 LMS, made the most of the new Britcar regulations and posted a fine win in a rain-blighted season-opener that was cut short by the horrendous conditions a half-hour early. 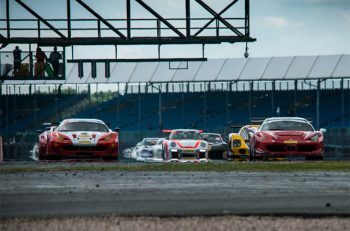 With a grid of 26 cars for the first round under the new Britcar management, and with the regs this year determining that the fastest driver in each car in qualifying must take the first stint in the car, most played it straight, but there were a few self-confessed sandbaggers, while some too were finding their way around machinery that had been delivered only days before the event, and thus unknown quantities. This was a race, too, of what might have been, with a number of significant front-runners eliminated or stymied in the early stages of the race. 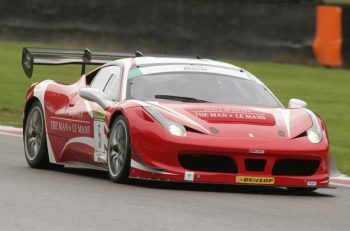 Pole-sitter Calum Lockie was one of those unfortunate ones, taking the middle ground up to Copse in the FF Corse Ferrari 458, while Adam Wilcox’s Audi R8 challenged along his right-hand side, and team-mate Johnny Mowlem edged to his left, before dropping back to slot in behind. Perhaps caught out by the conditions, the #1 Ferrari snapped, and went heavily into the Armco. There was more to come – Mowlem, now running second behind Wilcox, identified a puddle on the apex of a turn round by the Wing complex, and going off line to avoid it, found Nick Holden’s brand-new Renault RS-01 piloted by Andrew McKenna attempting to fill the vacant gap. There was a spin by the Renault, and contact, and while both cars eventually made it back to the pits, the Ferrari was too damaged to continue (“This is an endurance race, some people out there are just too racy too soon” complained Mowlem) leaving novice Bonamy Grimes to miss-out on his maiden race. The Renault was able to rejoin the race though, with Nick Holden taking the car to a 20th place finish, eight laps down on the winner. So, the two FF Corse Ferraris were out on the first lap, the Renault was delayed, and meanwhile Glynn Geddie had taken the lead in the ABG Motorsport-run McLaren MP4-12c, but that wasn’t to last either, the car visibly slowing across the start/finish line on lap 2, allowing Wilcox past, and then Javier Morcillo to get the jump on both of them in the Mosler, and seize a lead that he would maintain right up to the mandatory pit stops. Geddie, though, was pitbound with electrical gremlins, and, after several attempts to restart to McLaren were thwarted, it was retired. Jonny McGregor was performing well in the now-it’s-called-a-Taranis (the Caledonian God of thunder and lightning apparently), a masterpiece of self-designed re-engineering, and flying in third place, but he would be the next victim of the early attrition, retiring the car after several further exploratory laps before the first hour of the race elapsed, with drive belt failure caused by a faulty relay. “On reflection, if it wasn’t for that £5 relay failure, we could have kept that pace throughout, and probably won that race” he rued in later conversation. There were no problems for the Class 3 brigade, though, and they were working as a pack behind the leading Class 1 machines, Mark Cunningham’s Porsche 997 having to deal with a fired-up Chris Randall in the Lotus Europa, with Chris Hart’s Chevron and Jody Fannin’s Aston Martin Vantage just behind. Blasting past them all, though, would be Darren Nelson’s brand new Lamborghini Huracan; Nelson had elected to start at the back of the grid – a wise move given the carnage up front – and was now moving through. “We wanted to stay out of trouble at the start, and have some fun picking our way through” said Nelson later. And where was the eventual winner at this point? Hovering around fourth place, with relative novice Hanson posting some creditable lap times. Also starting out of place was Ash Woodman’s Class 4 front-running SEAT Supercopa, but his attempts to regain his grid slot during the pace laps earned him a stop-go penalty. Chris Randall had taken the Class 3 lead, and Chris Hart had followed him through, before the mandatory pit stops kicked-in just after the half-way mark, Hart handing the Track Torque Chevron over to Travis drummer Neil Primrose, and complaining of fuel feed problems and failed windscreen wipers. First of the Class 1 cars to pit was Ian Lawson in the ING Sport BMW Z4, hitherto unmentioned, but with Lawson doing his solid opening stint. Kevin Clarke took over, and with the weather giving no latitude for histrionics, a fifth-place finish, overall and in class, completed a steady run to the flag. Not so for Nigel Moore, though – taking over the Audi from Hanson with around 55 minutes left on the clock, he immediately punched in a string of stunning fastest laps in the treacherous conditions, unlapping himself from leader Morcillo, and carving through the field, assisted by the front runners now taking their mandatory stops and handing over to the “gentleman” drivers. Chris Randall, impressive in the Class 3 Lotus, handed over to dad Nick, Adam Wilcox brought the Audi R8 for Nigel Hudson to take the final stint, and Morcillo took it to the absolute time limit, pushing the mullions and transoms of the pit window before pitting the Mosler for Manuel Cintrano to take to car to the finish. The exception to this was Darren Nelson, the talented amateur leaving the final stint in the Lamborghini Huracan to national treasure Nigel Greensall. And so, that initial flurry by Moore had paid off, and with 45 minutes of the race left, he held a comfortable lead of over a minute and a half over Greensall, with Cintrano a further 25 seconds back. The weather then took a turn for the worse – rain of biblical proportions exacerbated by a driving west wind made the track virtually undriveable, and the officials sensibly, and rapidly, threw the red flag to halt proceedings, and, as one hour and 27 minutes of the planned two hours had elapsed, declared the results. Once a precocious teenage talent, Nigel Moore is now an established professional; “In these conditions, it never about the car, is it?” he questioned after accepting his winner’s trophy with co-driver Phil Hanson, adding about his run of fast laps “in this type of racing, you’ve got to be quick right out of the box, when it matters. Phil had good pace, and there’s more to come from him in this car”. Second-placed Nigel Greensall’s pace in his closing stint in the three day-old Lamborghini was solid rather than stunning, so he explained; “there was no way I was going to catch the Audi, it was over a minute up the road, so I was keeping an eye on the Mosler behind, stay out there and keep out of trouble”. The Morcillo/Cintrano Mosler kept third place, ahead of the Hudson/Wilcox Audi, and the Lawson/Clarke BMW Z4, completing the run of Class 1 contenders that went the full distance. Class 2 ended up under-subscribed after some class adjustments, and the demise of the Grice/Mowlem Ferrari, so it was the Porsche 911 RSR of Ian Heward and Darrelle Wilson that took class honours, 17th overall, ahead of the Garnham/Young Ferrari 430, which enjoyed an in/out relationship with the pits, and endured a spin on its way to 21st position. The Class 3 contingent made a fraught race at the start, and indeed the top six in class all finished line astern, but it wasn’t one of the original front-runners that came good in the end, it was the Century Motorsport Ginetta G55 of Jacob Mathiassen that came good in the end, which hardly figured in the early stages. “The strategy was all worked out on the pit wall by Benzo Lykke and Nathan Freke, we just had to keep it on the black stuff” admitted Fresle after the race. Behind them it was the father/son pairings of Cunningham and Randall, the Hart/Primrose Chevron, and the Murphy/Fannin Aston, the remaining class finishers being split by various Class 4 and 5 contenders, but worthy of mention; Tom Howard and veteran Formula Ford campaigner Frank Bradley steered Mike Moss’s BMW M3 to 13th overall, with the newly acquired Porsche 997 of returnees Dave Benett and Marcus Fothergill 15th, and courageous lone driver Rueben Anakhasyan next up in another Century Ginetta G55. It was a very close one-two for Geoff Steel Racing in Class 4, with Sam Alpass and Lee Atkins taking the win in the BMW E46 GTR, and singleton driver Del Shelton, in his first race for six years, coming home just 0.315 seconds adrift, and the class podium was completed by the Ashley Woodman/ Keith Hemsworth SEAT Supercopa. In Class 5 it was Alyn James in the Synchro Motorsport Honda Civic Type R, another car fresh out of the box and race -ready, with the podium completed by Glen Finn and Richard Burrows in the Cuda Drinks-sponsored Ginetta G40, and the Mini Cooper JCW of F3 Cup ace Alex Craven and Adam Bewsey. 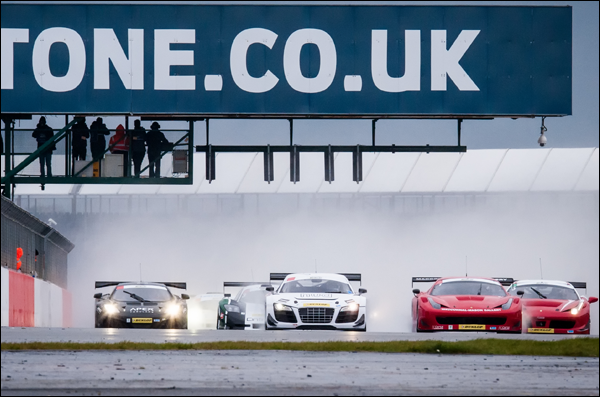 The championships re-convene at Snetterton on May 7th/8th. Next article VLN: 62. ADAC Westfalenfahrt, Race Preview, Lots & Lots of GT3 Cars!